Tim Richards, owner of Let It Shine Gymnastics, takes this scripture whole-heartedly. For the past 30 years, Richards and his wife Janie, have created more than just a program to teach gymnastics. “We are a kid ministry,” said Richards. “We try to partner up with different organizations in our area to minister to those in need. 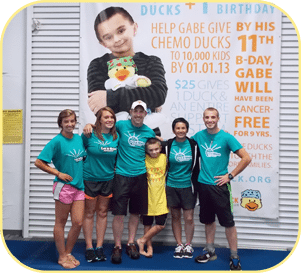 Over the past year, Richards has committed to sponsoring 200 ducks that will be utilized by children, families and hospitals to teach children about the various medical therapies they will experience over the course of their cancer treatments. Richards hopes that his gyms’ support of the program will help provide a little sunshine to the thousands of children battling cancer. “We have known Gabe and his family for years,” said Richards. “He has been involved in our program. Let It Shine has programs in both the Cool Springs and Spring Hill, Tennessee areas.